Most of my favorite television programs are from decades ago. A time when programming was more original than our viewing options today. 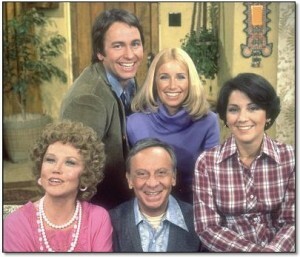 Take Three’s Company (1977-1984), for instance. One of the highest rated shows of its time, it was centered around three young roommates, (Jack Tripper, Janet Wood, and Chrissy Snow) and their landlords. The original landlord, Mr. Roper, refused to allow an unmarried male to occupy the same apartment as two unmarried women. Not to be swayed, because Jack needed a place to stay and the girls desperately needed a third roommate to replace the one who’d recently left, Janet convinced Mr. Roper to let Jack become Chrissy’s and her roommate by telling him that Jack was “gay”. Ultimately, Jack went along with the idea and the roomies lived mostly happily ever after. (Well, until a major cast change years later.) Think about how original and daring the premise of this show was? The Waltons, Little House on the Prairie, The Love Boat, Charlie’s Angels, and The Facts of Life are just a few of my other favorites from the 70’s and 80’s. Let’s not forget about the animated blasts from the past. The Smurfs, Scooby Doo, Deputy Dawg, Johnny Quest, The Flintstones, and The Jetsons (1962). I’ve never seen anything else that was as simplistic and still managed to be as entertaining as the Smurfs. The 101 three-apples tall, blue, not-quite people or animal beings who each had their own task that helped to keep their village running smoothly. Until Gargamel and his cat, Azrael, tried (at least once per episode) to capture as many smurfs as possible as the main ingredient for Smurf stew. 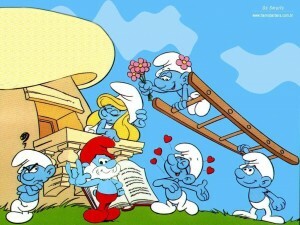 By the way, did you hear about the Smurfs 3D movie that will be released in the summer of 2011? Why? Why? Why? Can’t they just leave good enough alone? OK, back to the topic. Shows from days gone past were classic, original, entertaining, and many were very family-friendly. Today’s programming is made up of scripted “reality” shows, significantly violent “entertainment”, and topics that are not suitable for a huge chunk of the population. Thank goodness for online episodes, TV Land, and the availability of some of my favorite shows on DVD. My childhood memories are preserved forever; unless I make the mistake of watching a modern remake of my favorite old school shows. Let’s chat! What are some of your favorite old school television programs?